Six of Cups Tarot Card Meaning - All Explained HERE! The Six of Cups is the sixth card in the Cups suit. The children suggest it’s a look back to childhood. The cups are not being used for their intended purpose, but inventively being used as a vase for flowers. A pleasant positive card which brings back warm memories of the past. The Six of Cups represents innocence and positive nostalgia, as well as a simpler way of thinking. Past – The Six of Cups in the Past position means that you have had a standard and loving upbringing. You may have many good experiences of the past, especially during childhood. It’s nice to think about good memories. Don’t get carried away or think your golden years were in the past. You might also be thinking about a time in the past when you were very creative, but to you it seemed normal, like there was no other way around it. Peers however, thought it was an extremely good idea and that only you could have thought of it. Present – The Six of Cups in the present position means you might be spending a bit too much time thinking about what you consider to be the best part of your life. Usually there isn’t much harm in thinking about the past but don’t dwell on it. You can have better experiences now if you want, nothing is stopping you. We do not experience a ‘golden age’, and when the future comes, you can be nostalgic for the most mundane things. Take pleasure in life now, and do your best. Future – The Six of Cups in the future position means you should use your good memories of the past to set an example for your future. In ten years, do you still want to be looking back on those memories, or newer, fresher better ones that you’ve made since? Some of us fear change, but we look back and understand that it was for the best. Again, do not focus on the good things you have done, do not treat them as good enough. You could live a wonderful, envious life by constantly pushing and challenging yourself. Think back to what you wanted to do as a child, use that as fuel for your future dreams. Work / Education – The Six of Cups in regards to work or education could mean that you feel like you’re in a dead end job, or studying isn’t going as you’ve planned. When we were kids, everything was simpler. There’s no reason why that mentality can’t be brought into work and study now. Concepts to learn in education are easiest to grip through analogy. Try to get personal with your work and make it a part of you, not separate. Think of your childhood passions. Follow them, if you can. If you cannot, then try to adapt your passions into your everyday life. Romance – The Six of Cups in romance is a mixed blessing. You might have gone through the honeymoon period of a relationship and things are starting to calm down. Focus on the future and where things are going, using the past as a foundation. If you’re single and looking, look to your past. There might be somebody there who is right for you. Try to keep things simple for now. The love of a child is simple. Meet new people, have fun with them. 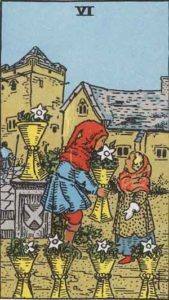 Friends – The Six of Cups in regards to friendship means that old friends might start coming out of the woodwork. This is usually a good sign. They might have changed a lot, but you still know them. It’s easiest to make friends while you’re in work and at school; so try not to lose touch in the first place. If you do, however, sometimes it’s for the best, as a reunion will feel fresh and exciting. Money – The Six of Cups in regards to finances isn’t a bad sign, but not the most positive. You might find that a sum of money is waiting for you, and really you could have claimed it a while ago. Does somebody owe you money? In which case they might pay you back soon. Don’t forget about it. Inheritance isn’t out of the question but don’t bank on it. Try to focus on simpler pleasures. We usually don’t need the biggest and best things on offer, and the things that are usually sold as the best are not in fact that. Health – The Six of Cups can mean that a past event, in childhood, is really affecting you, and has been for a while. Emotionally, you could have done something you either regretted as a child or wished you could have done differently. Don’t walk away from the past. Physically, right now you should think about being healthy, like a child. Children are so active, but usually don’t eat what is good for them. balance it out. Be active, eat well. Spirituality and Mentality – The Six of Cups in spirituality mean that you should just stay simple for now. No need for things to be complex. Life is only as complicated as we make it. Sum up ideas in one go, make analogies. Don’t think too much, just act on what you feel is the best course of action, so long as you aren’t so reckless. Imagine things from the perspective of a child. In reverse, the Six of Cups can represent an idyllic,often unrealistic view of things. Frequently, through TV, the internet and other media, certain aspects of life are exaggerated in certain ways so that when we achieve them, we do not feel like they are living up to their standards. How many times have you wanted to visit a new place, or try something new, and it hasn’t been the rush and thrill of discovery that you expected? Six represents balance, sympathy and trust. Six is well known in occult tradition and spirituality; the Hexagram being a well-known display of six. The Six of Cups in regards to numerology shows that you might be overthinking your problems. The best way to move forward is to think simply. What outcome do you really want? Move towards that no matter how difficult it might seem. If you have many sixes in a reading, it may mean that you’ve just gotten over a major event of your life and are nearing the recovery phase. We’ve selected live tarot readers to give you a FREE 3 Minute interpretation of The Six of Cups! Scroll through them below and pick your favorite one.